Gray (Greiners Raytracer) is a hobby/research project of mine. It is a program that simulates light to produce computer generated images. The technique used is called ray tracing, where a large number of rays are cast against mathematical 3D models to simulate the interaction between light and materials. The result is beautiful computer generated images, like the ones we are used to see in special effects in movies. A reoccurring problem in ray tracing is unwanted self-intersections when a ray bounces off a surface. Take for instance a mirror defined as a plane. When a ray is cast towards the mirror a hit point is computed on the mirror surface. But when we use floating point numbers, the exact point cannot always be represented as a floating point number. The computed hit-point may therefore lie on either side of the mirror offset by a small error. This causes problems when computing a reflected ray. If the hit point ends on the back side of the mirror, the reflected ray may hit the same mirror again instead of tracing away from the mirror. But why 0.00001? Originally I chose this number because it was larger than typical errors. This fixed some of the artifacts in my images where small holes appeared in my geometry. However this number only works if the scene geometry has a magnitude around 1 or so. What if the scene geometry is very large? Perhaps the mirror is placed at coordinate 100000,100000,100000. In this case an offset of 0.00001 is too small. Due to limited precision in floating point numbers (~7 significant decimal digits) 100000+0.00001 gives the number 100000, where 100000.00001 was expected. x is the number to compute epsilon from. scale is used to scale epsilon and must be > 1. Now we have a guarantee that vOffsetHit.x is larger than vHit.x with an amount at least 10 times larger than the smallest epsilon. Next 3 other arrays are created which are simply pointers to the same split-candidates. I have implemented an < operator for the pointer, so we can sort the pointers instead of the split candidates. Handling of pointers are much more light weight than handling the split candidates themselves. Now the split candidate pointers are sorted using standard C++ sort functions. This sorting is kept for the rest of the algorithm to avoid having to resort splits for every node that is computed. Next the call to the recursive algorithm starts. For each set of split candidates, the best splitting candidate is chosen as the one with the lowest cost. The split candidates are then split into a left side and a right side, and each branch is split recursively until the algorithm decides that a leaf node is cheaper than a branch. Since the split candidates are already sorted the number of objects on left and right side of each split candidate (this number is used in the cost function) is done by simply counting the objects while iterating through them from left to right and right to left. First screenshot from my new SAH KD-tree. The bunny is visualized using the voxels only. To better visualize the voxels traversal I implemented an interactive tool that allows me to trace a single ray while showing only the inspected voxels in that trace. This tool is very valuable debugging the KD-tree. One of the biggest problems with my current implementation of Gray is speed. My current implementation uses a simple KD-Tree that divides the geometry into two partions, a left and a right partion. The split plane is chosen as the center of the longest axis in the bound box. The Kd-tree builds very fast, but is not very efficient. Furthermore I support instancing of modelmeshes, which means that the same geometry can be reused. So first I compute bounding boxes for all meshes (or spheres or isosurfaces) and construct a KD-Tree containing all these models. Then if a model is a triangle-mesh this mesh is subdivided in its own KD-tree. This implementation behaves well if models are small and placed apart (no overlap). So e.g. 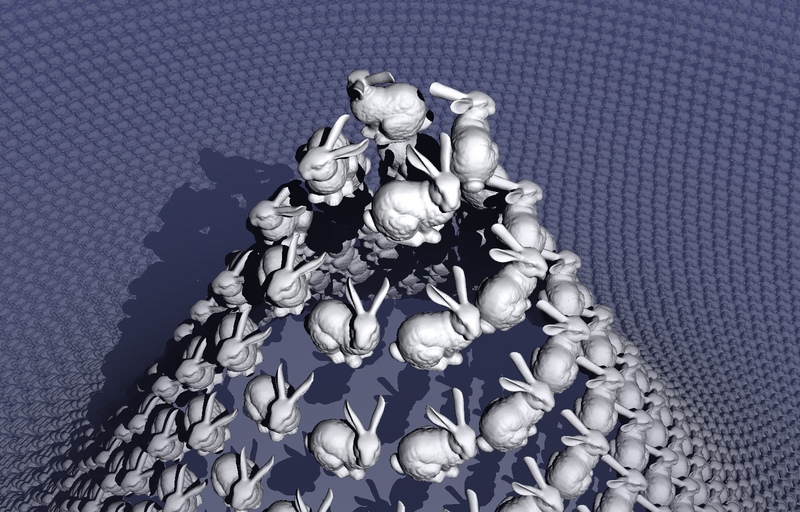 a field of bunnies renders very fast. But many scenes contains overlapping structures. The Sponza Atrium models makes Gray grind forever, because the meshes overlaps a lot and because the camera would be placed inside the model. So since, last winter (2009) I have been working on and off with a new Surface Area Heuristics KD-tree. My hope is that this new tree will make Gray perform much better in my current worst case scenarios. For producing parametric surfaces for Gray, I developed a small command line tool that generates a 3D model from a parametric function. The tools is for Windows, but the C++ source code can be requested if you need to compile for your own platform. I added some .bat files as examples. Below is the "Twisted Torus"
Another way of creating 3D models is by using parametric surfaces. A parametric surface is described by a function of two variables u and v that evaluates to a x,y,z coordinate. The function f(u,v) can then, by sweeping u and v over a range, generate points that can be connected to a mesh of small triangles. This yields a small flat square (rather dull to look at). More interesting are parametric surfaces that sweep through all three coordinates, x,y,z. I developed a small tool for making 3D models for my test scenes in Gray. The tool is a simple "lathe". A number of spline-curves can be drawn and when the curves are saved they can be rotated around the y-axis to generate a 3D mesh. The tool is not very flexible but it served my need at the time. More work from the winter of 2009. Work with caustics using photon mapping. With the photon mapping technique (described by Henrik Wann Jensen) I implemented caustics in Gray. Caustics is the play of light seen when light passes through a transparent object and focuses into intricate patterns on other objects. To produce these images, I start with with the light source and cast a large number of light rays into my 3D scene. If the rays hits a reflecting or refracting object the light bounces in new directions. When the light hits a diffuse non reflection object the position of the "photon" is stored into a photon map. The next step is to gather these photons again, but this time starting from the camera. When the camera rays hits a diffuse object the number of photons in the neighbourhood of the hit point is computed. The density of photons (number of photons per area) gives an estimate of how much light has hit this point. Here is an image. Notice the "shadow" cast by the pawn. My work with isosurfaces actually started more than a year ago (christmas 2008), but I have yet not posted any images on my website of my work. Isosurfaces are surfaces described with a formula rather than with thousands of small polygons. The benefit is that very complex models can be visualized using only little memory, the drawback is lack of artistic control and costly evaluation times of each isosurface formula. So what does an isosurface formula look like? One of the simplest is the sphere given by f(x,y,z)=x*x+y*y+z*z-r*r . The isosurface is given by all the x,y,z triplets that evaulates to 0 when inserted into f(x,y,z). Iso-surface because, all evaluations give the same value 0 on the surface. The way I ray trace isosurfaces is by defining a bounding box around my object. When a ray hits the bounding box, Gray evaluates the formula f. If f is positive, I move forward along the ray and evaluates f again. When f yields a negative value this iteration stops and the last position with a positive value is selected as a point on the surface. The trick to optimize this progress is the find some upper bound on the derivative of the formula f (how fast does f go towards 0). This tells me how far I can move forward and still be sure that f is positive. The actual implementation in Gray iterates in smaller and smaller steps until it is within some accepted threshold. This "rock" is a sphere, whose radius has been modulated with some fractal noise. Moving my old hand generated html homepage into the blog format. Hopefully with this format I will post news about my progress with Gray much more often than I did with the old homepage. M.Sc. in Electrical Engineering and software developer, making embedded firmware for work and programming ray tracing and computer generated images in my spare time.